Ingeotest, a Peruvian drilling contractor working in both lugite investigation and mineral exploration sectors, has recently received a new Jackal 4000 (formerly the Multitec 4000) to expand their current fleet. Requiring a multipurpose rig that could match or surpass the performance of dedicated machines for both applications, they purchased a Dando Jackal 4000 and have been delighted with their choice. In site investigation guise the rig is being used to hollow stem auger to predetermined depth intervals and run Standard Penetration Tests (SPT) down the centre of the augers. This is made possible by a unique three position hydraulically operated rotary head carriage that allows quick changeover from rotary to percussive drilling. 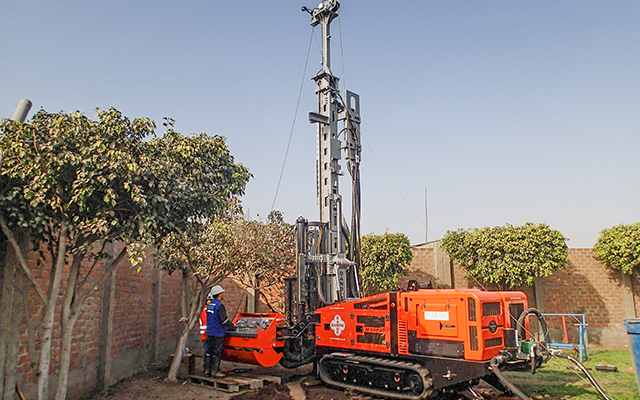 The company’s main focus for minesite contracts is wireline coring and reverse circulation drilling (RC). The versatile rotary head has four gears and is capable of 6000Nm of torque or 750rpm and therefore easily covers the customer’s exploration requirements. The fully modular design of the Jackal 4000 allows a tremendous number of specification options and truly make this a rig in a class of its own. Please visit the Jackal 4000 product page for further details.